Frost Trapper 2-blade with red and white swirl handles mint in wood display box. It is 4" closed with brass liners. Clip blade has Merry Christmas 2000 and the spay blade has LIMITED EDITION Coca-Cola; Coke bottle and Chattanooga, Tennessee. On the composite handle in logo type is Coca-Cola. This knife was made in Japan and was imported into the USA by Frost Cutlery back years ago. Features surgical stainless steel blades and nickel silver bolsters. Serial number 146 engraved on the front bolster in photo below. The knives are 11 years old. Made in Japan not made in China. The solid wood display box is 6-3/8" by 5-1/4" with parchment paper label with Santa Claus; Coca-Cola; Merry Christmas 2000; Coke bottle; LIMITED EDITION; COLLECTORS KNIFE SET and the inside of the box is black with the same label inside the lid as is on the top of the wood box. Each wood box includes a cardboard slip cover and is ready to wrap for a great gift. Frost Trapper 2-blade Merry Christmas 2000 Coca-Cola mint in wood display box. It is 4" closed with brass liners. 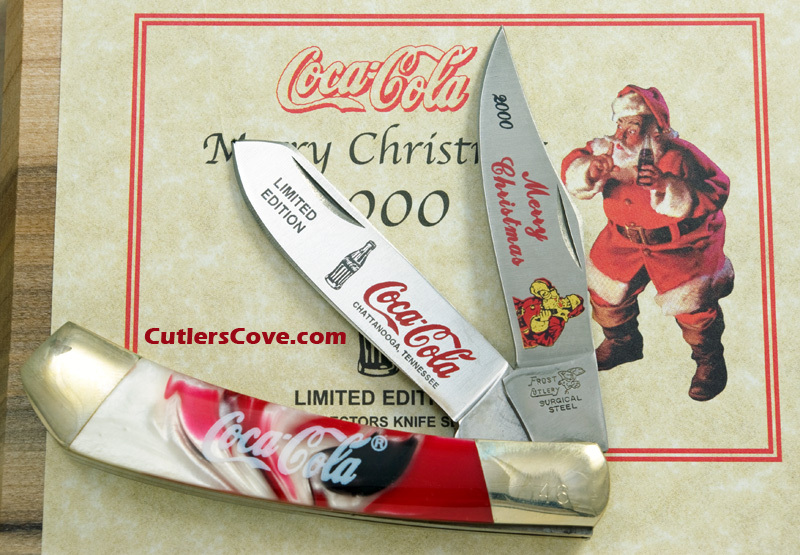 Clip blade has Merry Christmas 2000 and the spay blade has LIMITED EDITION Coca-Cola and Coke bottle. We have two for sale with different serial numbers. Each handle is slightly different and unique but the two knives and boxes are the same. Let us know which serial number you want.